Today Facebook reminded me of a memory. It is not a happy memory, but it is linked with many years of lovely memories. Six years ago, today, I had to say goodbye to my Dani – my ‘first born’ and the best dance partner I’ve ever had. She was twenty five at the time and developed a systemic infection related to having Cushing’s (aka PPID). Both my long time vet, and the vet who examined her at a local clinic, said that we could fix the infection with weeks of antibiotic – but there was a high likelihood of regular recurrence. Hearing the same story from both, my choice was difficult but clear. Fortunately, the clinic was in a lovely, peaceful setting, and there was a patch of high grass for her to peacefully munch as I told her goodbye. And so ended a partnership that taught me more than any human ever could. 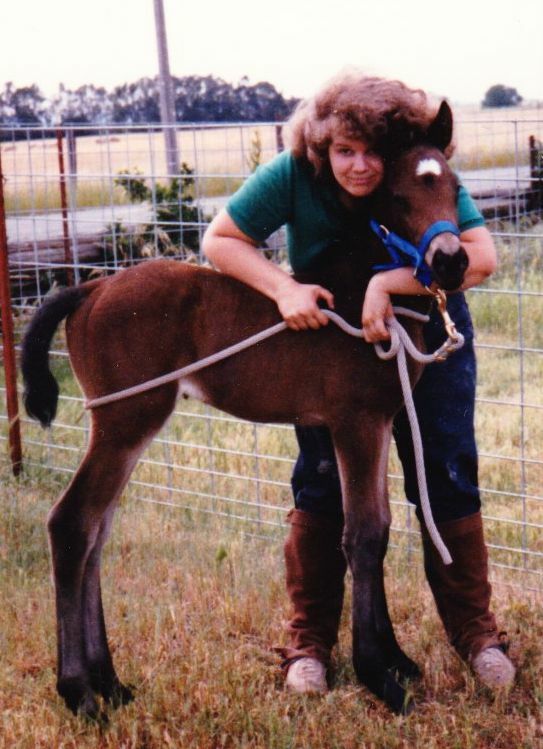 Dani was the first foal I bred. 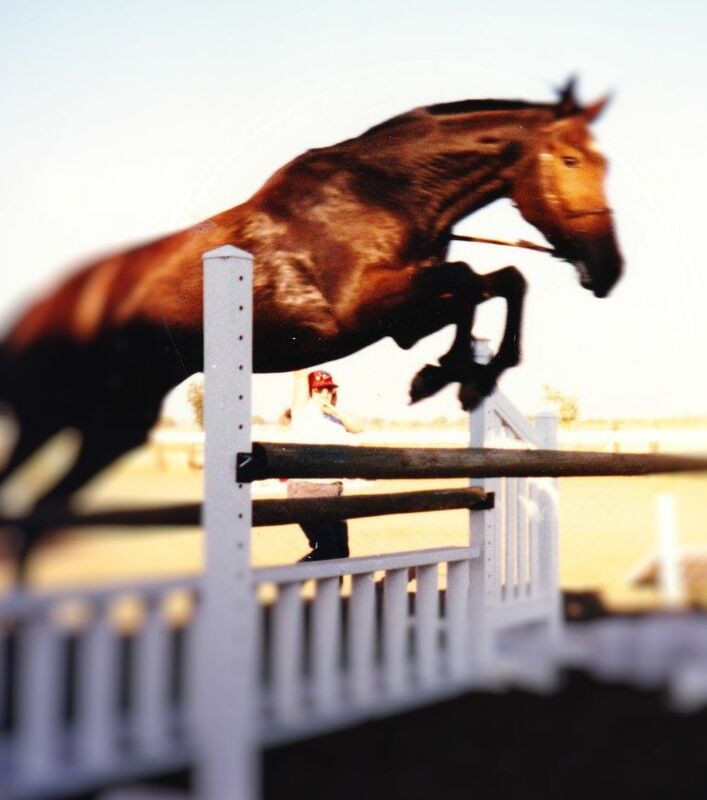 I fell in love with her father, a stunning Dutch Warmblood stallion by Nimmerdor, imported by the man with whom I took occasional jumping lessons. 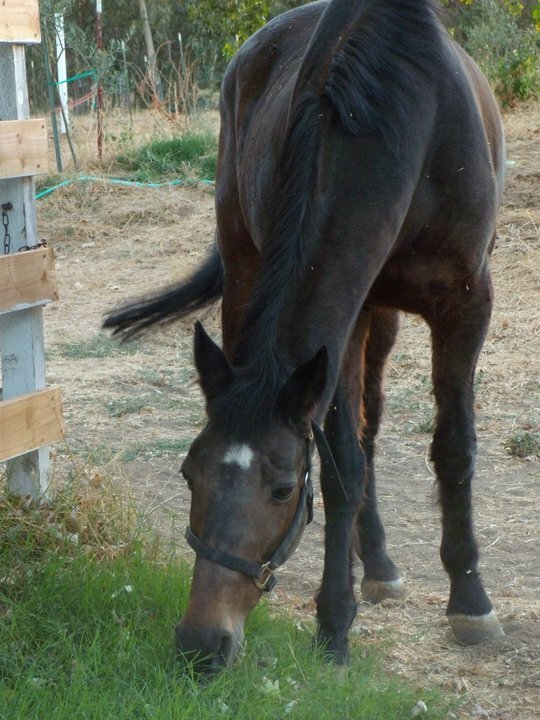 It happened that my veterinarian had a lovely bay mare she wanted to lease, so I took the plunge. The resulting foal seemed more giraffe than horse – surprising since both parents were rather substantially built. From the moment she hit the ground she showed her personality. Dani took longer than any foal we’d known to figure out where the milk bar was. She’d wander curiously around the stall, then try her hand at nursing on the wall, my jacket, our hair … really anything but her mom, who waited patiently for her foal to catch on. This rather distracted and daydreaming quality would be her trademark throughout her life. As Dani matured, I saw no signs of the Dressage horse I’d dreamed of. I was surrounded by lovely warmblood foals who exhibited their talents from the start. Dani, on the other hand, was leggy, spindly, and a rather plain mover. Never once did I see her lengthen her stride at the trot. By the time I started her under saddle, I’d decided to sell her as a jumper. She was not only bred for it, but she’d shown aptitude from a very young age. Fortunately for me, in the end she did not sell, and I learned that she had a tremendous aptitude for Dressage that was merely waiting to be uncovered. At just one week old, we took Dani and her mother out to the arena – at that facility, the only thing we had for turnout. While her mother grazed on the edges, Dani did what foals do – she ran. I was snapping pics of our new bundle of joy, when I saw her headed for disaster. She had turned across the arena, and was picking up speed with a cross-bar set up right in her path. I was too far away to act, so I held my breath. She was surprised by the obstacle, but managed to clear it anyway. Then she did the unimaginable – she circled back around and jumped it again! I was standing there, my mouth open, forgetting the camera in my hand, when she once again circled around and jumped the cross-bar in perfect form! This time she went off bucking, clearly pleased with herself, as I kicked myself for missing out on the photo op! We were at a show, with the ring set up in an open field that included the parking area. I was halfway through the test, with my mother reading the test from the sideline. She’d just read a movement when I heard her calmly say “Loose horse.” I came around the corner to see two horses bolting straight for the ring! I halted Dani and debated staying on or dismounting – but the horses were moving too quickly for me to choose, so I sat quietly, told her to stand, and hoped for the best. Both horses galloped across the ring, one passing mere feet from Dani’s nose. I could feel her shaking, but she never moved a hoof. Once the horses were caught, we resumed our test and ended the day with high score of the show! I knew that day that I’d gained her complete trust – and she certainly had mine! Another fond memory was the day I talked my mother through a canter pirouette, without her knowing I was doing it. She recently wrote a guest post, about the experience. What a joy to see a rider I taught, on a horse I trained, execute such a complicated movement with such ease! 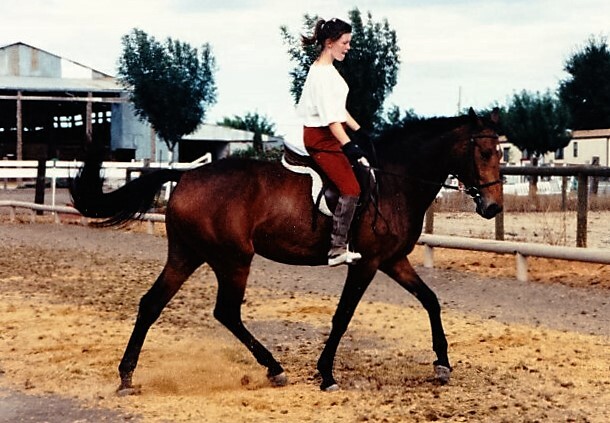 Dani, in her first year under saddle, with one of my students on board. Dani was probably the best instructor I’ve ever had. She taught me about patience, and being creative in my approach. Pushing through a problem was not an option – something she made clear the day she nearly went over backwards on me. From that moment on I learned that if the front door was barred, there was always a backdoor. With Dani, I also put into reality everything I’d understood in theory – Dressage finally became a dance, with movements coming from invisible aids that sometimes felt like little more than just a thought. With the development of collection, we unlocked an extension I’d never dreamed was in there. Everything I’d worked so hard to learn was finally coming together. Many subsequent horses have benefited from all that Dani taught me. It was not in the cards for Dani and me to take the world by storm. In hindsight, I probably should have taken her out more, just to go places and gain more confidence away from home. When she was relaxed and listening, we were usually high score of the show – when she was tense, we’d be lucky to place. Perhaps more miles of just traveling, with no pressure, would have put us both at more ease. But the other roadblock was her intolerance for metal in her mouth – only a soft rubber bit would do for ‘the princess’ (her nickname, referencing “The Princess and the Pea” for her sensitivity). FEI levels would never have been an option, because a double-bridle was completely out of the question. She was otherwise so generous that I could not feel compelled to force bits upon her that were not comfortable. Besides, I was losing interest in showing at that point. I did not like the direction the sport was taking, so it was no inconvenience to just bow out. It is always difficult to say goodbye – but some are distinctly harder than others. To this day, I am looking for the partner who can make the dance as beautiful as it was with Dani. Perhaps it will never come again. But if it does, it will be a direct result of all that Dani taught me. Six years later, and I still miss you, princess … I hope that you, your mother, and Ben are enjoying yourselves across the Rainbow Bridge! This entry was posted in My Journey and tagged Dani, Dressage, horses and teachers, saying goodbye. Bookmark the permalink. I so enjoyed reading this. What a treasure trove of memories. I especially loved the “loose horse” at the show memory. It is so hard to loose these partners. Just today Facebook reminded me that five years ago I still had my horse Tommie. That tugged at my heart. I wrote a blog piece about having to let him go ( When is it time to say goodbye?). Horses , our teachers! Thanks for this post. Thank you, Anne! It is truly difficult to lose them … but aren’t we so privileged to have such special horses to begin with? As I wrote this, I was simultaneously crying and smiling. I am glad it touched others … and I will seek out your post about Tommie!